A few months ago I was still working at a bookstore. A customer came up to my register and put down a Lonely Planet Mandarin Phrasebook. I greeted him and scanned the book. He asked, "Do you know if this is useful?" I looked down at the book. I smiled. "I don't know this one specifically, but Lonely Planet is a reliable name." He seemed satisfied and paid his twelve or thirteen dollars for the book. As I was slipping the receipt inside it he said, "Could you take a flip through and make sure it's okay?" Sure, I thought. Pages were sometimes missing. At the time, I had found a handful of books with pages printed upside down. I flipped through it. It looked okay to me. I put it on the counter between us. "But is the Chinese okay?" I blinked. The frustrated ball was beginning to form in the pit of my stomach. I had a suspicion, I had a feeling. I maintained my smile and struggled to hope. "I'm not sure. I don't speak Chinese, sir." He took the book and scoffed -- snorted, really, I kid you not. He tucked the book inside his jacket pocket and turned to leave. "Not a very good Chinese person, then, are you?" I was washing rice and next to me was a rotisserie chicken from Safeway. It was still in its container, still wrapped up its plastic bag. It still is, I can see it from where I'm sitting. Some of the rice I cooked is probably going to be eaten with the chicken, by my parents. The chicken, I imagine, is moist and a little salty and very delicious. Wrist-deep in starchy water, and I could smell it. Drinking over-steeped tea, I could smell it. Sitting here, typing this, I can smell it. I never noticed how chicken smells. There's the obvious semi-barbecue smell, unique and tempting all on its own. I know that smell. It's familiar. 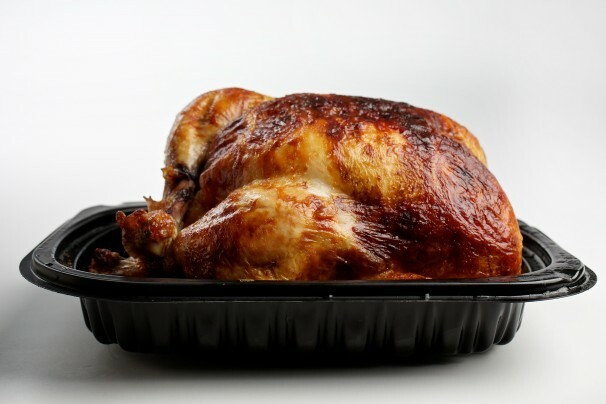 A whole chicken from Safeway (or Costco or anywhere else, really) is a great value- meal for the whole family. Find a side, some potatoes or rice and some vegetables, and you could feed a family of four for two, maybe three, days. I used to really love those chickens. I bet I'd still love it, if I ate it. My parents are going to eat it in an hour or two with some coleslaw for sure and perhaps rice. I haven't eaten meat in a while. Not really. There was a mishap with a deep fried dumpling that had some shredded chicken in it a little while ago. I still haven't forgiven myself. I am not writing this is an attempt to convert anyone to vegetarianism. I'm not comfortable with that. I'm not comfortable with calling myself a vegetarian, even. I'm not comfortable with eating most meats, is all. What is interesting, slightly disturbing, and the motivation for me typing this first blog post is the smell of chicken. I don't think I can describe it. My partner and I haven't brought meat into our new apartment yet. He's eating some duck that my parents bought, but I cheerfully fill our meat drawer with various kinds of tofu. I haven't been around meat, not really, in a while. I almost didn't recognize the chicken smell, and when I did I realized it smells totally different than the last time I was near one. The easy explanation is that my senses are just more sensitive to the smell. Except that my dad has been eating barbecue pork and my mom soy duck for the last couple of days. The pork has smelled mouth-watering good, but I know for sure I can never eat pork again and the better it smelt the more disgusted with myself I felt. I've never liked duck, the thought has always irked me so I've trained myself not to react to the smell of it (my partner and mother both love duck). And yet the chicken. The chicken smell. It bothers me, for sure. It makes me think of descriptions of factory farm operations that I won't repeat here, for the sake of focus. It also interests me, because it smells so completely alien. It inspires me to reflect. In The Omnivore's Dilemma, Michael Pollan talks a bit about how chicken has changed so much that it no longer tastes like the chicken our grandparents or great-grandparents might recognize. His suggestion, I think, is that when we use the phrase "tastes like chicken" we are actually acknowledging our own devaluing of flavour: something tastes like chicken because it doesn't taste like much of anything. So, has being away from meat awakened some deep part of my brain that now properly smells what it (or chicken anyways) smells like? Maybe I am now aware of a smell because I am not consuming as much meat as I once did. Meat is such a huge part of most people's lives, it was a huge part of mine, and perhaps something that at least North American's might take for granted. I no longer take it for granted, I simply avoid it, and standing next to it doing something normal and even comforting suddenly awakened me to a new smell. I've spent about 30 minutes writing this and I'm already adjusting to the smell. A part of me is disappointed. Another and louder part of me hopes I don't smell it again. As a final note, I just want to add that I didn't actually like The Omnivore's Dilemma. I wrote a brief Goodreads review about it here if you're curious, but I wouldn't recommend you seek it out.